A British citizen (born to Sri Lankan parents) living in Switzerland spent three weeks in his paternal roots recently. His experience has been a mixture of attentiveness, excitement, and fascination and at times hilarious with a few repulsive, disturbing and irritating experiences. At Zurich airport, Emirates Airlines did not permit him to board the plane, despite having a valid entry visa (obtained on line). The airline’s refusal was based on the fact that his British passport’s validity was five days short of six months! The problem compounded when the visitor arguing on the basis that he had paid and obtained a valid visa from Sri Lankan authorities. Airline desperately phoned the immigration authorities in Colombo, the first immigration official refused point blank to allow him to visit Sri Lanka. Further justifications by the passenger made Swiss officials to contact the Controller of Immigration direct, who authorized the passenger to embark the plane. This goes to show the hassle tourists have to undergo, having paid US$30 for the visa, due to some officials’ incompetence. His second experience at immigration counters in Colombo was in a long queue that put him off when there were umpteen numbers of immigration counters but minus the officers on duty. He had to play ‘musical chairs’ by jumping from one queue to another in an attempt to get out fast! There were no pens for the convenience of tourists to complete their embarkation cards. Air passengers usually do not carry pens during flights to avoid ink leaking on to their clothes due to pressure in the cabin. If Sri Lanka expects an exodus of tourist arrivals, there should be some orderly manner to deal with immigration activities without making the visitors inconvenienced and irritated as the airport authorities are fully aware of flight arrivals and, as a matter of fact, planes do not land every three minutes as in Western airports. The visitor detected the immigration officers’ faces to be grouchy, which is a common complaint not only from foreigners but from locals as well. Do they have to give passengers the impression that they are confronting criminal investigation officers? This question was posed to the BIA General Manager and subsequently to the Deputy Director of Customs at the Airports during the ‘Pethikada’ programme on Sirasa TV programme. Both officials while acknowledging the complaint maintained that the immigration officers might be fatigued having to work 24/7. Surely flights from Katunayake airport do not land or take off every three minutes in Sri Lanka like at Heathrow airport in London. Where do we hear that anyone works 24/7 in an establishment in Sri Lanka continuously? Does it cost them anything at all to be polite to passengers? This particular visitor found motorists in Sri Lanka taking a suicidal approach at every turn of their steering wheel. He was shocked, seeing people doing a tango in the middle of the Zebra crossings on roads to avoid flimsy frames of metal of three wheelers coming at speed and hitting pedestrians; Pedestrians give hand signals or plead for their dear lives, halfway through yellow crossings, for the mere fear for their lives. Sri Lanka made quite a difference to him coming from clean Switzerland and was shocked to see the garbage menace as a health hazard and nauseating. Public transport was an area he voluntarily avoided. Apart from the dangerous aspect of travelling in tuk tucks, he was disgusted with the way taxi drivers swindle foreigners, despite meter operation. He detected three wheelers, even with meters, having a variation in meter readings for the same distance. Naturally, tourists will seek for a reliable cab service when they arrive in Sri Lanka and safety remains their first priority. The major problem here is the general tendency of taxi drivers to rip off ‘foreign looking faces’. Most of the reputed taxi service providers offer a web booking system, which can be used to book a taxi and enjoy their stay in Sri Lanka. Such reputable cab companies are operating in Sri Lanka currently. He found at the end using one or two such companies, where he did not have to part with cash to the driver, instead all charges were debited to his credit card. Although almost all the cab companies use GPS facilities, the worst problem he experienced was that majority of the drivers could not speak understandable English; so much so, his English to the drivers and drivers’ Sinhala to him became Greek! Another major disaster was that he found one of such reputed company drivers substituting a driver from Kandy as a replacement, who did not speak English or knew Colombo roads at all. This was immediately reported to the company as the visitor had to use his Google map to direct the driver to get to his destination in the dead of night. The first priority of a foreigner to Sri Lanka remains his safety in hiring a cab. Foreigners generally do not like to hire taxis at streets, if they could help, without being sure of the driver’s credentials and his driving skills. In such a scenario when a reputed company sends a driver, and if the driver plays havoc, then surely the company has to take the full responsibility. He was taken by surprise when he visited Yala he had to cough out Rs 3,000 for an entrance ticket, despite having a Sinhala name, whilst his Sri Lankan “cousins” had to pay only Rs 60. Fair enough he thought, if the tourist industry needs money, but at least the payment should compensate with the facilities!. To his horror he found toilets to be disgusting and repulsive – no toilet paper, filthy and some of the sanitary ware were broken. If there are separate and high charges for tourists he was under the impression that the authorities should have two types of toilets – similar to CGR suggestions at railway stations exclusively for the use of tourists. 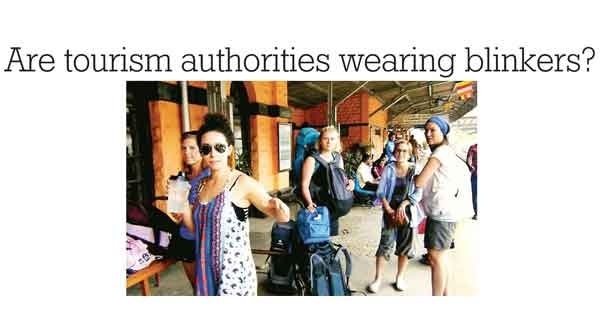 One could imagine the amount of publicity Sri Lanka can earn by word of mouth when tourists who experience such nastiness and when they return to their countries. All the experiences, made this Sri Lankan-British very sad about the image of Sri Lanka when the country is portraying to the visitors as a Paradise Island. Remember we have a 3000yers of glorious history, says some but not me. I found Sri Lanka fine whenever I visit. Which is usually during the northern hemisphere winter period. In fact in many ways Sri Lanka is now a much better place to visit and live in than before. Mainly due to six years of rapid development and progress following the end of the war in 2009 by the previous government. Especially Colombo these days which has a very good standard of living in my opinion. and is a totally transformed city from before. I don’t know what the Sri Lankan expat living abroad in this article is complaining about. Surely he knows this is Sri Lanka and not Switzerland! I don’t mind standing in a que at customs in Sri Lanka. Border Custom officials have a hard and very important job as it is. In all cases in my visits to Sri Lanka you pass immigration without any problems. In most walks of life you have to que anyway. So why is the visitor complaining about queing at border officials. I generally visit Sri Lanka when it is winter in the northern hemisphere. I can tell you for me at least during this time Sri Lanka and Colombo is a very much welcome change. Certainly if you have quite a bit of money Colombo is a great place to live in these days. Which brings me to my only gripe regarding Sri Lanka especially Colombo. Its very much on the expensive side. but I suppose it is worth given all the facilities on offer if you live in Colombo, but this shouldn’t be a problem for Sri Lankan expatriates either visiting or many have returned to live and bought property and moved back to sunny Sri lanka having lived decades overseas in countries like US,Canada,UK, Europe, Australia, NZ having done very well in those countries and returned back to Sri Lanka with their vast fortunes. Surely many of them are not complaining. I don’t know what the point of the article is. Sri Lanka is a great place either to visit as a tourist, or to live in especially Colombo if you got the money. I understand your point of view, as you say, most of the time you stay in Colombo perhaps in an Air Conditioned room with proper amenities. But if you plan to visit the historical places and Buddhist temples, do you know that you will be consider as a tourist if you don’t carry your local ID or Sri Lankan Passport and have to pay hefty admission fees for almost everywhere you go. Even if you pay Rs4500 of admission fee, be careful, they don’t have even a decent facility to answer the call of nature. You may be asked to go to the nearest bush. Where else in the world you come across Buddhist temples where hefty admission fees are charged to participate in Buddhist religious activities. It is a disgrace to the Buddhist community in Sri Lanka to allow these things to happen. This entry was posted on Tuesday, March 28th, 2017. You can follow any responses to this entry through the RSS 2.0 feed. You can skip to the end and leave a response.